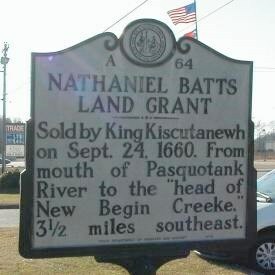 On Sept. 24, 1660, King Kiscutanewh sold Batts tract 3 1/2 mi. S.E. from the mouth of Pasquotank River to the "head of New Begin Creeke." Located on US 17 Business in Elizabeth City, the subject marker was long situated in front of the Museum of the Albemarle, which has since relocated to the city waterfront area. The facts recorded on the sign mark a seminal event in the history of North Carolina. The sale in 1660 of a tract of land by King Kiscutanewh to Nathaniel Batts, earliest known white settler and owner of the earliest known house within what is now North Carolina, is the earliest known recorded deed in North Carolina. Batts divided his time between Virginia, where he owned 900 acres, and his house—or more correctly his trading post—in the 1650 and 1660s. In 1672 George Fox, a Quaker missionary, visited Batts, noting that he “hath been a Rude, desperate man.” One of the witnesses to the 1660 deed was George Durant, who acquired land in the area a year later. In time Batts also purchased Heriots Island (later known as Batts Island) at the mouth of the Yeopim River in Albemarle Sound. Place names in northeastern North Carolina today bear the names of both Batts and Durant.